A satirical political cartoon reflecting America's imperial ambitions following quick and total victory in the Spanish American War of 1898. In June of 1899, Congress had authorized and President McKinley had appointed the Isthmian Canal Commission, charged with making a "full and complete investigation as to determine the most feasible and practicable route across [the] isthmus for a canal... under the control, management, and ownership of the United States." (Walker 1901, 11). By the fall of 1899, McKinley's popularity was high and he seemed likely to be reelected (as he eventually was, with Theodore Roosevelt as Vice-President). The American flag flies from the Philippines and Hawaii (annexed during the War as a strategic way station) in the Pacific to Cuba and Puerto Rico in the Caribbean. President McKinley stands with one foot on U. S. soil and the other on Mexico, pick axe in hand, rolling up his sleeves to dig the Nicaraguan canal. (Mexico is badly distorted, with its northern border shown below Baja California, thus improperly enlarging the apparent size of the U.S.) Bound from Hawaii and Manila and the West Coast, "American Goods for Foreign Countries" are lined up to pass through the canal to Europe. An eager Uncle Sam is bringing more tools from Washington, saying (in the caption below), "Finish the canal, McKinley, and make our national expansion compete in your first administration." 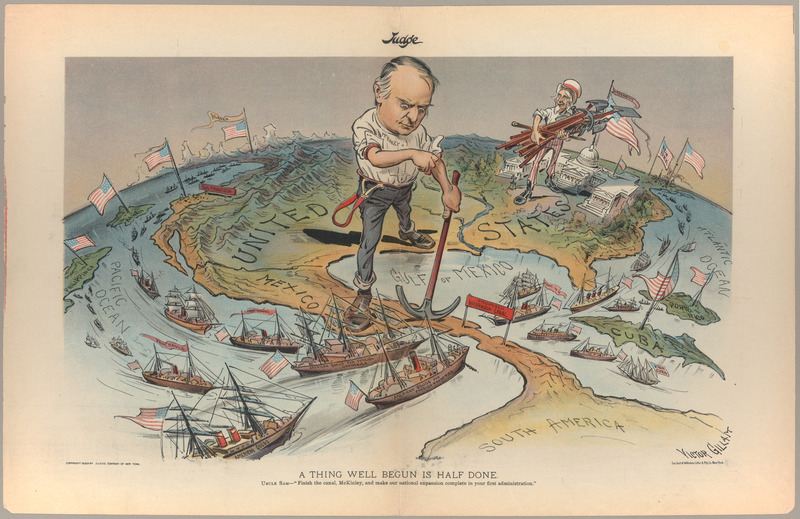 During this period of time, Judge Magazine published at least five cartoon maps supporting and encouraging U.S. expansionism. See ID # 1123 (The Trouble in Cuba), ID #1132 (Unlucky "13"), ID #1136 (A Thing Well Begun is Half Done), ID #2126 (Hands Across the Sea), ID #2154 (We Must Finish the Nicaragua Canal). Its competitor, Puck Magazine, was more cautious. See ID #2141 (His 128th Birthday. "Gee, but this is an awful stretch!"). Judge Magazine, October 7, 1899.